Hi friends! Hope y'all are having a great week so far. When we first moved into our rental house, I shared that I was having trouble decorating the built-in bookshelves in our living room. Besides the Expedit in our office, I've never had a big shelving unit to decorate. It's a little daunting, that's for sure. And since we're renters, we're left without options like painting or papering the back of the shelves. After a couple of months of pulling inspiration from Pinterest, all of you and some of my favorite decor magazines, I decided last weekend that it was high time I stock up those empty shelves. Here's what I've got so far. I can't say that I'm thrilled with it, but I know it's an evolving process depending on the season, my whim and whatever new decor I whip out. Want some detail shots? I like this side of the built-in because the other side has an uneven shelf. My Type A self prefers the symmetry of the right side... ahh. See what I mean? For some reason, it looks like they took a shelf out of the left side. It's wonky! And hard to decorate. Basically I had to pull a plant in to help fill up the space so it didn't look so awkward! If we weren't renters, I would permanently hang something in the back of this shelf instead of just leaning it up against the shelving. That would look super cute! But for us renters, it will just be Mr. Plant to the rescue. I'm so in love with that rustic wooden vase I picked up from Target awhile back. I think it really contrasts well against the pretty floral china, don't you? At least that was the thought! I tried to ground the unit with lots of pops of black, balanced throughout the shelves. Like I said, I'm not in love with what I've done so far, but I know it's a start. I think I just need to keep adding junk to the shelves, don't you? Weigh in with any advice you have in the comments, por favor! Goodness knows I need it. Michelle, if the shelves are adjustable, can you just take one from the right out and then move them so they are all even? Looks great though. Hey Lauren! Unfortunately, no : ( All of the other shelves are affixed. Great idea, though! looks great! I actually like that the shelf is missing and you can get height interest with plant. Makes your eye get drawn all over instead of competing with the balanced symmetry, kwim? It looks GREAT!! 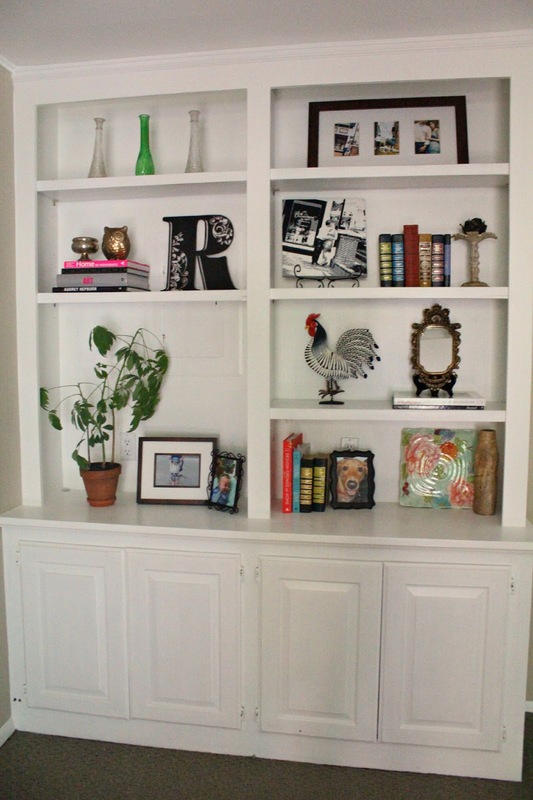 i just posted today about bookshelves in my built in Desk area, I used contact paper on the back, we are also in a rental, and that was the one room we were asked not to paint! Thanks for the input, Jule! I will definitely have to play around with some of those ideas : ) And check out your book shelf as well! Ditto to a big piece of art in the left corner, I think that would look great. Love the way you've got things styled! Looking good! 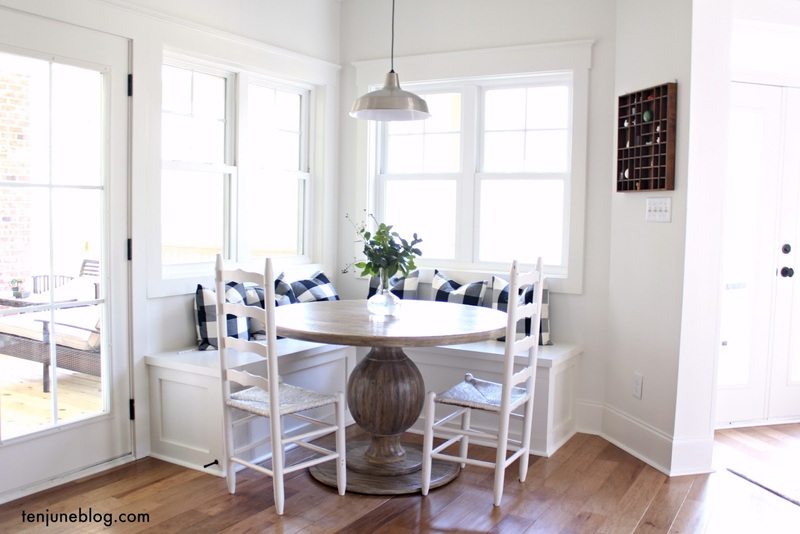 It's a great alternative for renters and you can change it out whenever the mood strikes. 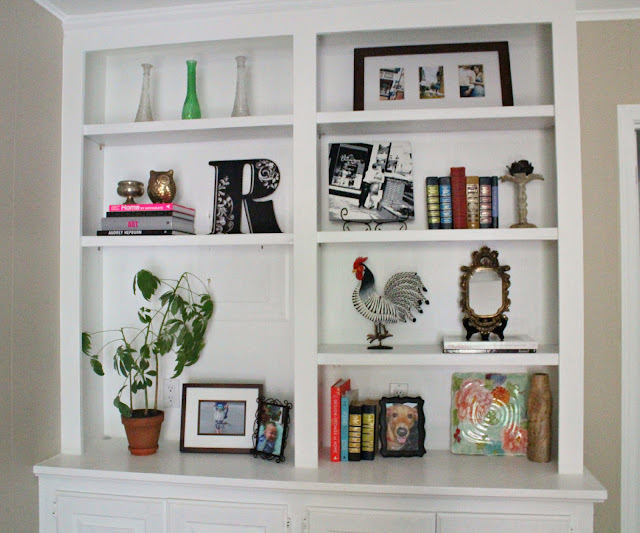 You could do a solid, a pattern, or mix it up from shelf to shelf. Check it out. As a fellow renter who also has a permanent home I don't live in, I firmly love and believe in the Command 3M strips and hooks! They make life so so much easier when hanging things. I've used them in three different rentals now and I love that I can still hang décor and not have to patch holes when I move. I'm seeing a larger piece of artwork propped in that big space on the left -- you're so crafty, what about a DIY abstract painting on canvas? Or you could frame a piece of your fave fabric and prop it there. Tall candlestands would also be cool. Wonder if they had a TV in that space? It reminds me of how our bookshelves were configured when we moved in 14 years ago. We got lucky though and the shelves are adjustable. Good luck! You're off to a great start -- love the chicken! They look great! I love the plant...maybe try something big and colorful propped up behind it...like a canvas or something? Michelle, you are making your new pad so cozy! It's really looking great. I recently added some square baskets to my bookshelves for a little natural, textural space filler. I love how the chunky baskets fill up the shelves without being too busy. I think you're off to a great start though! Super cute, Mich! I love that you're taking your rental and making it yours :) Maybe some colorful / patterned fabric could be applied to the back of the shelf to make it all pop? I don't know. It looks great as is, too!